QRCA’s Annual Conference 2013, Mission Exploration, delivered on all that was promised and more! 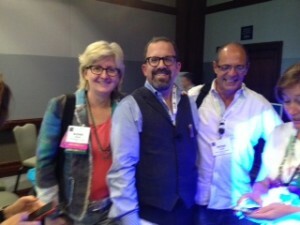 The QRCA conference sessions were action-packed, chocked full of great takeaways. I especially appreciated the Tech-Master, Lester Greenberg’s brilliant presentation on technology efficiencies. Lester introduced us to a plethora of available technologies, and important quick tips on use. His ability to translate on a layperson’s level and charm us at the same time is a gift! As I’m in her audience frequently, it is no surprise that Colleen McKenna’s presentation was stellar. “Best speaker I’ve ever seen,” is the word on the street! If you have not had the privilege, look up Ms. McKenna on your LinkedIn profile, as well as your ability to professionally connect; it will yield great benefit. If you attended the conference, you can download presentation decks through the QRCA website. If you are a member but did not attend, look for encore conference performances at QRCA local chapter meetings. Moving forward and embracing new ideas! Susan Abbott, Lester Greenberg, & Peter Lovett. This entry was posted on Tuesday, October 22nd, 2013 at 7:35 pm. Both comments and pings are currently closed.